Laura writes, "Hi, could you add these 3 pictures to my profile @ Rocky Point Beach? "I went to Narragansett town beach...a 2 mile walk R/T...and found some brown, some sea foam, a piece of ceramic, but Rocky Point.....way outranks Narragansett Town Beach. Big time. "The moon tide has great results. "Thank you David & Lin for this awesome website!" Sure, Laura. We've added your photos at the top of the page. 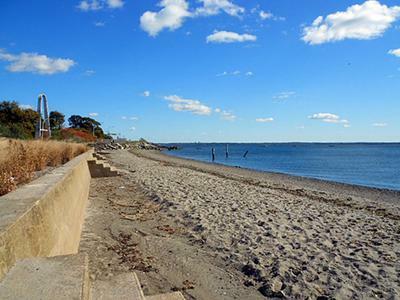 October 2012 - Rocky Beach in Warwick, RI has been re-opened as of 2012. This area was closed since Rocky Point Park closed in 2006? Rocky Point Park was an amusement park that was right on Narragansett Bay. My husband & I went to Scarborough Beach & found some pieces, (mostly white, green, olive& brown). I suggested we go to Rocky Point Park to walk around, etc. Instead, we found so much glass, even a cornflower & a lot of amethyst, sea foam & the usual green, brown & white. Which is fine for me. idea first thought of by Captain William Winslow in the 1840s. By 1847, he had purchased a portion of the land and began to offer amusements and serve dinner. From the 1950s through the mid 1990s, Rocky Point Park was one of the most popular attractions in Rhode Island. It featured rides such as the Skyliner, Corkscrew Loop Roller Coaster, Log Flume, and the Freefall (similar to the identically named ride at Six Flags Magic Mountain), which fell 13 stories at 55 mph (89 km/h). It also featured the Shore Dinner Hall, famous for its clamcakes, steamers, lobsters, and New England Clam Chowder, which seated over 4,000 patrons at a time. In the early 1990s, Rocky Point's financial situation became shaky. The privately held company that owned the park began to lose money as it attempted to keep the park up to date. Rocky Point closed in 1995, then reopened briefly in 1996 as a farewell to patrons. Rides such as the Flume and Corkscrew were sold in an auction and are now in use at other amusement parks. On June 25, 2011 Rocky Point was once again opened to the public and features a new asphalt mile long walking path along the shore of Narragansett Bay although much of the area of the original amusement park itself is still fenced off and closed to the public, including the Shore Dinner Hall. Then head there to find your share of its history. 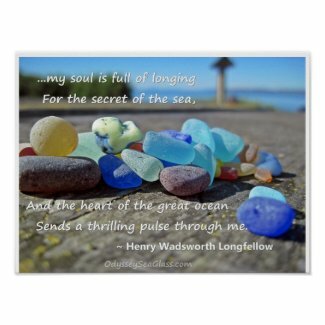 In 8 years, I have never seen any tumbled and frosted sea glass from Rocky Beach. It has only produced poor quality craft B grade barely can be called sea glass. Go somewhere else. 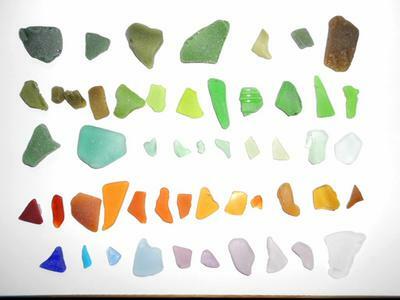 I first started to hunt this beach in 2011, and there was always loads of glass browns, whites, green, aqua and lavender, plus the occasional rare piece. Now i'm lucky in i get a handful on a super low tide with no one else around. If there is anyone on the beach or it is a weekend i don't even bother going any more. Good waves...populated and a good stretch of shoreline to walk. Remember to check for low tides in Narragansett Bay & esp. after a 'nor easter this "balmy" winter. December 28, 2014: Definitely a great place for seaglass...mostly green, brown and clear but did find a beautiful blue, a heart shaped white and some interesting shades of green and pink and light blue. 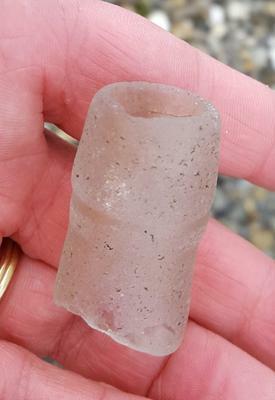 I can understand why beaches on Narragansett Bay are loaded with glass considering our history. 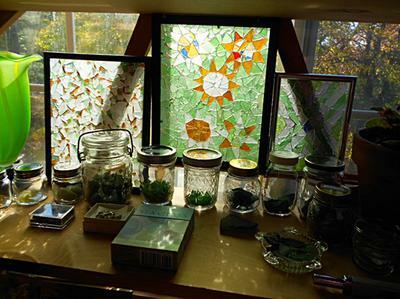 Reminded me of some of the places I've found glass in Europe. I always go to this beach to look for sea glass, and always come back with lavender, sea foam, white, the usual. But I went here yesterday and found a peach piece, gray piece, and wait for it....a completely frosted, whole dark green bottlestopper buried in the sand....my best find ever. Best beach in ri for sea glass. With the upcoming change of weather patterns & temps & esp low tides, I need to show awareness to fellow artists who happen to appreciate not only the walking aspect, the seals (harbor), the view & the sea breeze. Pure enjoyment to find them, get some exercise & some Vitamin D.
D as in determined I will come back home with a piece of Rocky Beach. And the wherewithal to return over & over again. 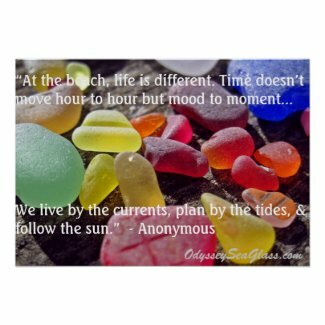 I share because I care for our fellow sea glass members who ARE NOT AFRAID to disclose where they found their pieces. We went to RB yesterday after the remnants of Hurricane Sandy. We found lots of amethyst, sea foam & white. The usual brown was there, but we did find 3 pieces of cornflower blue. I will post pictures. Remember to go to next low tide which is next month ! I am orig. from Massachusetts and remember going to Rocky Point as a kid. Sounds like you hit the jackpot!